There is evidence that dash churn have been around since the sixteenth century. It is an upright container made of wood or earthenware, a lid, and a stick that has a round, perforated, or cross-shaped attachment. 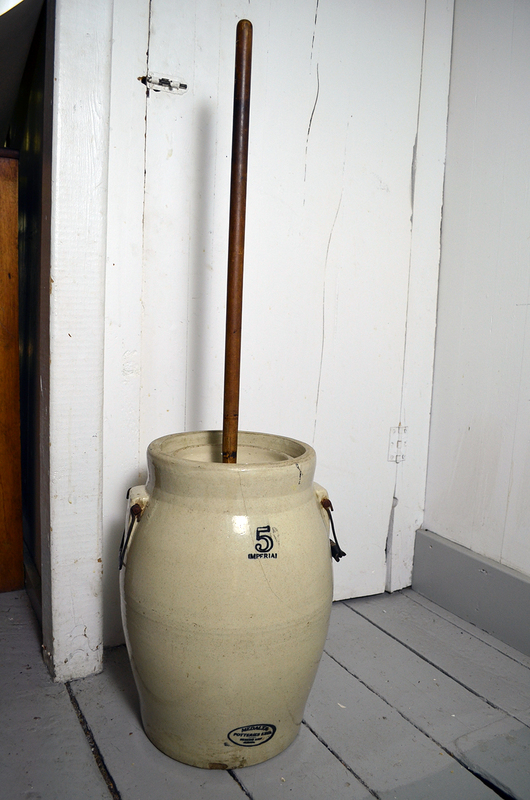 The stick, known by such names as the dash or churn-stick, is moved up and down to churn the butter. Churning is the agitation of cream, which forces the butterfat particles to separate from buttermilk. Before churning, the churn and all butter-working tools need to be washed with salt water to keep the butter from sticking to it. The churn is partially filled with cream and then the churning begins. At one stage during churning, the cream will resemble whipped cream, but will very quickly separate into grainy butterfat particles and buttermilk. Then, the buttermilk is drained off and the butter is washed with cold water to remove any remaining buttermilk, and the butter is salted. John Walter, who came from the Orkney Islands, might have referred to the dash churn as the plout kirn and the dash or churn-stick as the kirn staff.